than naming a kid Fox? 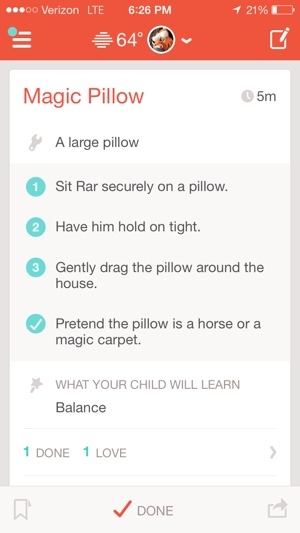 A new app called Knoala, developed by parents of young children, seeks to keep playtime fresh. Designed for parents of kids aged 0 to 5, the iPhone app is a giant repository of fun, quick activities to boost critical skills in developing minds. When you first use Knoala, you’ll be asked to enter your kids’ birthdays to help the app choose age-appropriate activities. From there, Knoala can serve playtime ideas up at random, or you can use the included filter to choose something much more specific. When I searched for an artistic, indoor October activity that takes 10 minutes, for example, the app suggested making tissue ghosts and paper plate pumpkins. If spooky specters don’t float your kid’s boat, that’s OK – there are over 2,000 activities currently waiting to be discovered, with more added every day. And indeed, that’s one of my favorite parts about Knoala – it’s not just an app, it’s a creative social network. Parents are encouraged to submit their own ideas for activities, which the Knoala staff then curates for inclusion in the app. If you want to get even more social, there’s a Twitter-like follow feature that lets you share photos of your kids’ completed activities and post comments about what worked and what didn’t. Stuck in the grocery store checkout line? Knoala lets you turn that downtime into learning time with its video section. There, you’ll find age-appropriate YouTube clips from Sesame Street, the Muppets and more. Knoala is a free download for iOS devices on the Apple App Store. To learn more about the app, visit its webpage at knoala.com.